With the popularity and increased availability of broadband/ADSL more and more people are getting connected to this fast, always-on internet connection. If you would like to find out if broadband is available in your area, try checking BT's ADSL finder. If you find that BT's website is broken/designed by morons, then you can enter your postcode in the form below, which will hopefully extract the relevant information from BT's database but using proper HTML. Generally you will need to live within 3km of the telephone exchange which also needs to have been upgraded to cope with broadband connections. Another criteria is that you can't have any fibre-optic portions of line between your house and the exchange, but it's probably best to leave checking like this to the ISP that will provide your ADSL connection. You may also want to have a look at www.adsl-guide.org for some more information and product reviews. Deciding which broadband company to go for can often be a minefield, but as most ISPs require you to sign up for a minimum contract period of a year, it's worth checking out everything before you sign up, as a mistake could be quite costly and difficult to change. In a nutshell, most ISPs are pretty much the same from a technical point of view. If you're a casual user the main difference is the speed and whether or not they impose bandwidth capping (ie. limit how much you can download within a certain period, like a day). I'm personally completely against NTL/Virgin, mainly because their technical know how is virtually nil and they know nothing about RISC OS. In addition, their billing/administration department are run by completely ignorant, incompetent staff. My own experience proved that they could forget to take direct debits, charge you for late payments, disconnect you, charge for reconnection or anything else - completely at random. In the end, I cancelled in disgust. Speaking to other people, confirmed that it wasn't just me they made mistakes with, and they're still just as incompetent. Anyway, you want a minimum of 512K download speed (anything slower can't really be called broadband) and unless you've already got an email account with another ISP, you require a full internet account. I make this point because a number of people have contacted me after going for the cheapest deal they could find, only to discover that they have no access to an outgoing mail (SMTP) server. This is because, for security, ISPs only allow you to connect to their outgoing mail server if you're physically connected to them. Some of the cheaper deals don't provide this facility and can then charge up to another £10 per month for the service. To be honest, you don't really need a RISC OS aware ISP because, once it's all configured and setup, it's pretty much the same settings on any computer and should stay working unless you change something your end. Some other things to consider are whether or not you require a static IP address (which is essential if you want to run your own server or access your machine when away from home). This can be free with some of the more expensive ISPs or cost extra on some of the cheaper ones. Expect to pay up to about £10 extra for a static IP address if it's not included free. Their Usenet news service doesn't seem to be that reliable though. Zen - Zen has been recommended by a tech-savvy friend of mine as another reliable ISP - but I don't have any personal experience of them. If you would like to recommend others, please contact us. You should avoid the following ISPs, who are, IMHO, the worst in the UK. Tiscali - Unreliable and tech support appear to have zero knowledge. AOL - Force you to use proprietory software, NOT RISC OS compatible. Virgin - Reportedly unreliable service, and having spoken to their tech department on numerous occasions myself, have zero knowledge about anything more complex than turning the Cable box off and on again. In order to connect your computers to the telephone line (once it's been upgraded to broadband) you will need an ADSL modem or router. These generally come in two types; USB or Ethernet connections. I would recommend an ethernet connection because it is more standard and generally easier to setup and configure. A lot of the USB solutions appear simpler (being supposedly 'plug and play' but generally only work with Windows and Macs). They also lack features and flexibility, especially if you want to connect several computers via a local area network (LAN). It's best to go for a combined modem/router which will provide the connection to the actual telephone (modem part) as well as connect to your local network computers (router part). Personally, I bought a Solwise SAR715 router, which includes a built-in firewall and four ports for computers. This particular model is no longer available, but a selection of routers are available from Digital Phenomena's hardware page. If you opt for the ethernet router (which these instructions are based around) you will also need a network card fitted in each computer you wish to network. For RISC OS there are two network cards available; Those manufactured by Simtec and sold by RComp and Stuart Tyrrell Developments and those manufactured by Castle Technology. You will require one with an RJ45 port, for connecting to the router. This will cost around £100 but anyone thinking of purchasing a new machine will find that most current machines include a built-in network card as standard. Lastly, you will need some Cat-5 cables; one for each machine you want to connect to your network. The length will depend on how far apart your machines are. I would recommend getting the shortest leads you can, in order to keep it as tidy as possible, but I've successfully used a 20m extension with no loss in network quality. You may also want to purchase some micro-filters which allow you to split the ADSL connection (from the phone socket) into two signals; the adsl signal which goes into the router and the telephone 'voice' signal into which your existing (analogue) phones can be plugged into. You will need one microfilter for each 'existing' analogue device in your house, so for example if you have two telephones and a normal dialup modem you will need three microfilters - unless one of the existing phones is plugged into the existing modem, in which case you'll only need two. A rule of thumb is to get one microfilter for every phone extension point in the house. Once you have your line enabled for ADSL, you will want to plug in all the equipment in order to get your network up and running. Decide which telephone point you are going to plug the ADSL router into. 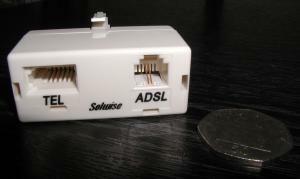 Then plug in the first microfilter and connect the ADSL router to the 'adsl' socket in the microfilter. Once you've plugged the router into the phone socket, you are ready to plug the computer into the router. When everything is wired up, you need to configure the router in order to connect to ADSL. This is similar to the way a normal modem is configured, except that all your username and password details are stored within the router, rather than entered when you dialup with a modem. Once the router is configured, it will connect to your ADSL ISP for you and all you need to do is setup a standard network connection from the computer to the router. However, before you can do this you need to configure the router in order to connect to your ADSL connection. This is generally fairly generic for all routers and consists of visiting the IP address of the router in a web browser. Most routers have a web front-end to their configuration so that you can complete various forms and save the settings to the routers memory. I've got some detailed instructions on how to configure the Solwise routers, but they should enable you to enter the relevant parameters into your own router. Once You're Connected! What Software do you need? The thing to remember with broadband connections is that you don't actually require any dialup software in order to connect to the internet. Therefore you don't require the Ant Suite (although you will probably want it for fetching mail/news if you're currently using it), Voyager or any of the other 'internet suites', as you can connect directly through your network connection. However, you will still need a web browser and mail/news fetching applications, along with a suitable email/news client. When your router is configured correctly and BT have enabled ADSL on your line, you should be able to connect to your ISP straight away. As long as the networking configuration is set correctly, any RISC OS web browser should be able to surf the web straight away. Load Fresco or Oregano etc and try visiting the BBC homepage. In order to download mail and/or news messages you will require some 'fetcher' software. There are several solutions for this. There are commercial packages such as the Ant Suite or Voyager or there are freely downloadable applications such as POPStar or NewsHound for downloading mail and news respectively. In addition you will require an email and/or news client with which to actually read and write your emails and news messages. Marcel comes with the Ant Suite. Posty comes with Voyager. MessengerPro and Pluto are two stand-alone mail/news clients and are both RISC OS 5 (Iyonix) compatible. · The Ant Suite - Instructions for setting up the Ant Suite for use with broadband. · POPStar - Setting up POPStar for fetching mail via broadband. · NewsHound - Setting up NewsHound for fetching Usenet news via broadband. · ntl:home and RISC OS - A guide to broadband cable internet and RISC OS. · My 'intranet' - Richard Murray's guide to installing and setting up a home 'intranet'. · Basic Home Networking with RISC OS Computers - Covers everything from cabling to software required.